This was the script for my TEDx talk — The Four Sins Of Success. I cannot hide it anymore. I have committed a lot of crimes. I lied. I cheated. I stole. And I killed. You must be asking why I have committed such horrible crimes. All my life, I have seen countless smart, and hardworking who are unsuccessful. I cannot count how many unsuccessful people who are chasing their passions. I asked myself what are the real keys to success? Life is just like riding a bicycle, if you stop moving you will fail. If you don’t ride a bicycle, you are less likely to get an accident. If you go out there and face your fear. If you get on that scary bicycle. If you are willing to fall and hurt yourself, one day you will get to the finish line before everyone who chose to walk. In life, if you don’t put yourself in danger, you will never have a chance to experience all the wonderful opportunities out there. That is why I chose to lie. I have never been an expert in anything. I started a nonprofit organization before I knew how to write a proposal, get funding or promote a campaign. I became a marketer, before I knew what marketing was. I started a business, before I knew how to sell. Not being an expert makes me a better person. I put myself in dangerous situations where I must move forward. Because I knew nothing, I didn’t follow the rules. Because I knew nothing, there weren’t any best practices. There was no limitation, I could see the situation from a different angle. Because I knew nothing, I thought like there was no box. As long as you still accept the existence of a box. It doesn’t matter if you are inside or outside, the box is still there. You are still influenced by the box. Lie to get the opportunity that you couldn’t get. The best opportunities are always the ones you are not ready for. Don’t wait for the perfect opportunity, you will get all the leftovers. Lie to yourself and create your opportunities. Tell everyone who you want to be not who you are today. But lying wasn’t enough. I realized I have to cheat. I cheated on my friends. I cheated on my family. And most important of all, I cheated on myself. 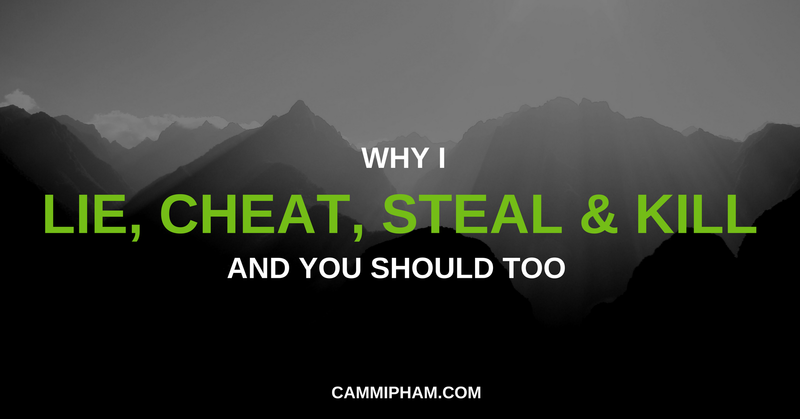 If someone tells you that you can become successful without cheating on people. They are lying. Every decision we make in life will have positive impacts on some people and negative impacts on others. For every action, there is a reaction. We cannot have it all. People tell you it to sell books. Someone needs to change self help books to feel good books. Having it all is a dream that everyone wants to have. In life you have the energy to focus on one thing and be very good at it.You cannot work on 10 different things and hope one of them will work out. You need to work harder and smarter than everyone. You need to figure out how to be better than everyone. That comes with a price. Cheating means you need to stick with your vision and spend most of your time turning it into reality. Cheating means you will do what is good for you instead of what you want to do. Cheating means you learn to say no to others. I chose myself, I chose my dream, and decided to cheat on everyone including myself. Many of you will tell me you cannot do it. Cheat on everyone and yourself to make it happen. I have lied and cheated… but it wasn’t enough. If you steal an object, it will last until it is used up. BUT …If you steal knowledge, it will be with you until your last breath. There is a sea of knowledge out there, but why isn’t everyone successful? Because people don’t appreciate things that they get for free. People always go after things that they cannot have. We are too busy trying to steal things that we cannot keep, and forgetting about knowledge. Instead of trying to steal someone’s success, learn how they built it. Steal their knowledge and build your own. If you didn’t build something, it will never be yours. The minute you try to stop learning, you start dying. To be successful you need the right knowledge. At any price, get them. At this point I don’t have much left. I decided to kill. I always ask myself why most people with passions never become successful. The answer is simple, because they love something too much, they cannot see life clearly. They don’t know when is the right time to kill their idea. They don’t know when to give up. There is no bad or good idea. Every idea can be good if it is at the right time, right place and be executed by the right people. Every idea can be bad if at one of those three is missing. Nothing is more dangerous is holding on something that is no longer relevant. Time is your best friend, but it is also your worst enemy. If you keep holding on to the past, you will miss the future. We need to get over our fear and learn to kill our own ideas. We have 2 ears for a reason. One to learn and the other is to unlearn. Get rid of old knowledge. You have to kill the old, to accept the new. If you want to be successful, learn, unlearn and relearn. Many years ago, a startup developed a podcasting platform and nobody was signing up. They cheated on that project by having a side project. They stole a different concept and build a platform on top of it. That project showed a tiny bit of traction. They decided to betray all the supporters of the main project by killing it and focus on the side project. The CEO made an offer to all their investors. If anyone wanted their money back, he would personally buy their stocks back at cost. 100% of the investors asked for their money back. That side project was Twitter. Their lies became reality and made them billionaires. We wouldn’t have Twitter today if they didn’t lie, cheat, steal and kill. You can decide which side you want to look at. We are the artists who can give them meanings. You can look at Lie, Cheat, Steal and Kill and say they are bad words. Or you can take action and show the positive sides of those words. It is your choice. Success is not about chasing wealth. Success is not about chasing power. Success is not about chasing fame. Success is about chasing what will make you happy. Nobody knows exactly what is it except you. Why are you letting society define who you are now and who you are going to be? Why are you letting everyone to tell you how to live your life. Don’t let your ideas die slowly in the back of your closet because you want to fit in. If you want to fit in with the 99%. You will never become the 1%. You live in a box. You drive in a box. You work in a box. One day you will be buried in a box. Don’t live your life in a box. Think and live your life like there is no box. Lie. Cheat. Steal. Kill. Crush The Box. Originally published at www.cammipham.com on September 11, 2016. P.S. Thanks for reading this far! If you found value in this, I’d really appreciate it if you recommend this post (by clicking the ❤ button) so other people can see it!. Don’t forget to join my mailing list to receive free business and life hacks.